Dimensions 1 by 6.75 by 10.50 in. 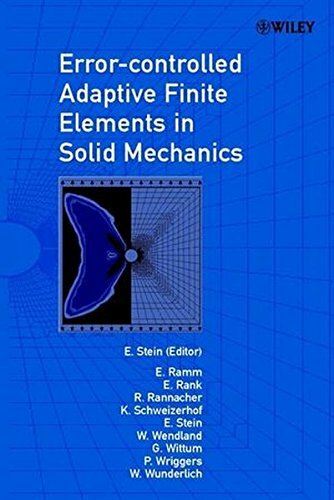 Amazon.com description: Product Description: Finite Element Methods are used for numerous engineering applications where numerical solutions of partial differential equations are needed. As computers can now deal with the millions of parameters used in these methods, automatic error estimation and automatic adaptation of the utilised method (according to this error estimation), has become a hot research topic. This text offers comprehensive coverage of this new field of automatic adaptation and error estimation, bringing together the work of eight outstanding researchers in this field who have completed a six year national research project within the German Science Foundation. The result is a state-of-the-art work in true reference style. Each chapter is self-contained and covers theoretical, algorithmic and software presentations as well as solved problems. A main feature consists of several carefully elaborated benchmarks of 2D- and 3D- applications.